A recent bathroom trend we’ve noticed that bathroom design has skewed from a more practical approach to a greater emphasis on feel and aesthetic. People are thinking more of their bathrooms in terms of a space not only to prepare for the day ahead but also a room to relax in - a sanctuary to escape our busy lives. As a result we are seeing bathroom renovations taking on a more luxury feel. 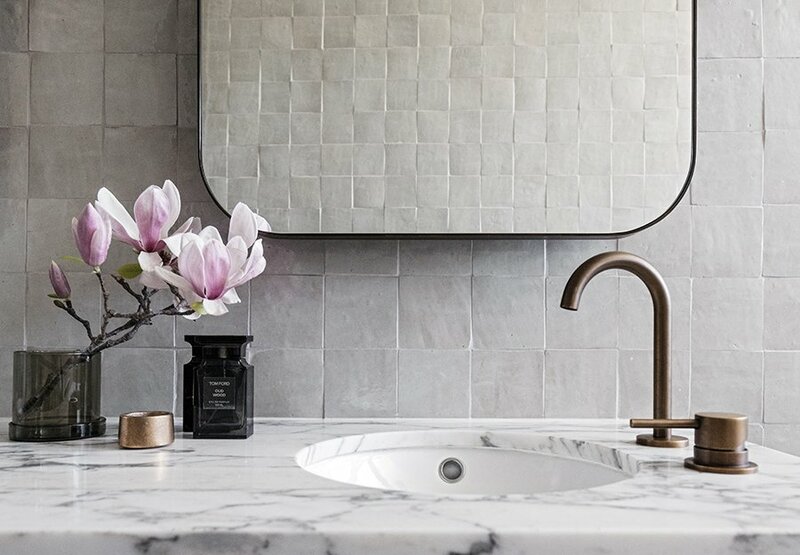 Today’s modern bathrooms would not be complete without eye-catching finishes, on trend fixtures and spa-like accessories with a perfect balance between form and function. In this month’s Balnei & Colina Journal we cover the top bathroom items you need to create a bathroom renovation that’s practical and still feels like a luxurious retreat. The following bathroom items will have your bathroom feeling more like a relaxed sanctuary, whilst still providing the functionality every bathroom needs. Including a statement pendant in your bathroom renovation either over a bathroom vanity or bath is a great way to weave some luxury into the room. A bathroom pendant can add a touch of personality as well as support your overall bathroom style or theme and is an easy way to update your bathroom look. Design Tip: Decorative lighting although an easy addition, but must be well thought out and planned in terms of safety. Your Balnei & Colina bathroom designer will be able to assist you with this. All light fittings must always be installed by a licensed electrician. There is no substitute for custom cabinetry and shelving in a bathroom renovation. Custom joinery will give you the opportunity to customise all your storage requirements. With so many personal grooming accessories to store, everything from straightening irons to your favourite bath salts, and electric razors, it’s important to create smart storage solutions that will help keep everything you use within your bathroom easily accessible and out of sight. This will help produce a renovated bathroom that is uncluttered, clean and inviting. 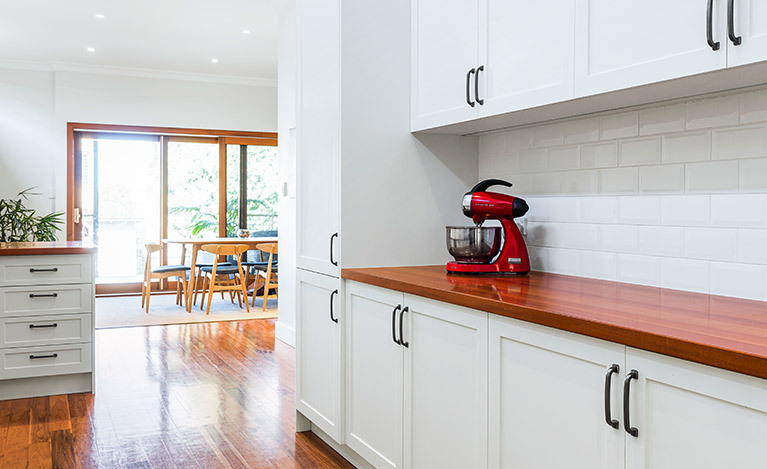 You can also customise your cabinetry and shelving to support your bathroom style - from natural looking timbers, classic shaker style cabinetry to crisp white minimalist doors and shelving - with custom joinery the choice is yours. Include a custom shower niche or ledge to neatly house shower and bath items used on a daily basis like shampoo or body wash.
Introduce open shelving for additional storage and to display bathroom decor items like your favourite plant. Design Tip: A custom wall hung vanity will not only provide much needed storage but help create the illusion of space by not taking up valuable floor space. With bathrooms becoming a place of retreat, rather than a place to ‘wash and leave’, taps and fixtures that offer a ‘spa’ like experience are highly sought after. One of these is the ceiling mounted rain shower head. A completely immersive experience, more and more home owners are opting for this type of shower head for their bathroom renovation. Design Tip: Rain shower heads have a larger diameter and are much wider than a standard shower head. This means you need to have the right amount of space for a ceiling mounted rain shower head in terms of height and width to allow for excess spray from showering. Your Balnei & Colina bathroom designer will be able to assist you in determining whether or not this type of shower head is feasible for your bathroom renovation. Wrapping yourself in a soft warm heated towel after showering or bathing is now something everyone can enjoy with a vast array of heated towel rails available for every budget. Not only are they a great space saving solution for towel storage they come in a wide variety of designs and finishes to suit any bathroom style. A custom bathroom renovation will enable you to include strategically placed chargers and powerpoints for your tech and powered bathroom accessories. Items like hidden chargers and powerpoints will remove unsightly cords and make your bathroom space feel uncluttered and a pleasure to work in. Design Tip: The Mizu Bliss Walnut iPad Holder can be strategically installed so that you can safely stream your favourite show whilst having a bath or play background music whilst getting ready for your day. A smart mirror will also complement your modern bathroom renovation. The Milli Glance Magnification Mirror has a defogger function, infrared on/off sensor and LED dimmer function to assist in creating mood for your bathroom. Ensure you keep your bathroom basic PC items on trend. This will ensure your bathroom renovation doesn’t date as quickly. Freestanding baths are now being used as statement pieces. Using a freestanding bath can help create a luxury focal point for your bathroom renovation and tie your look together. A back to wall toilet is less bulkier that traditional toilet suits and can help create the illusion of space with clean lines and a smaller footprint. Still unsure what bathroom items to include in your next bathroom renovation? Leave it to the experts at Balnei & Colina. For more information about our bathroom renovation services or to book a design consultation, call 1300 450 320 or send us an email.